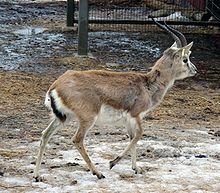 The goitered gazelle, black-tailed gazelle or Persian gazelle (Gazella subgutturosa) is an antelope. It can run at high speed, without the leaping and bounding seen in other gazelles. It is found in a large area of Central Asia, including part of Iran and southern west Pakistan in the western end of the range, as well as the Gobi Desert. The specific name means "full below the throat" and refers to the male having an enlargement of the neck and throat during the mating season. This page was last changed on 2 May 2015, at 14:26.